I’ve given Pinterest a go, and occasionally I remember the app when I have the iPad in hand and peruse it a bit. But I’ll admit that it’s never really clicked with me. I don’t have very many things pinned – and even though I have a few things there, I rarely go back and look and what I have pinned. I do get notices when someone repins something of mine, or if I get a new follower, which reminds me that I’m supposed to be participating, but that’s about as far as my initiative takes me. It’s also a huge source of traffic to this place from images people have pinned from third story(ies), so hello to you guys! Occasionally I’ll get an email from a friend who was searching for something on Pinterest and ran into an image of mine somewhere, which is kind of fun too. I’ve never “followed” anyone on Pinterest, so forgive me for being sort of clueless, but I’m assuming if I did then I would get notifications when those that I follow pin something – although I’m guessing I could probably adjust my notifications to reduce that. Still – have you looked around that place? There are people following a zillion people with a zillion pins – that’s a lot of images traveling around there. It sort of makes my head hurt. The above gibberish aside, I’m here to say that I actually made something that I saw on Pinterest. On one of those perusing trips around the Pinterest boards of the (highly motivated and organized and crafty) people that follow (boring and unorganized and unmotivated) me, I saw this pin. And even though I know Pinterest links back to the source (although not always the original source), I’m still slightly obsessive about linking to original sources, so here goes: I found it on my friend’s Pinterest page, which links to this source, but here’s the original source (and maker). I saw this many months ago, long before E decided to have a gumball themed party, but I remembered it – even though I never repinned it. (Which sort of makes me wonder if I really need Pinterest because I seem to work best when I have the glimmer of an idea in my own head.) I also just use Google Images a lot – run a search for homemade gumball machines and you get dozens. But I’m still calling it as Pinterest inspired, because that’s where I first saw it. This is one of those projects that is just so ridiculously cute. I think it’s because I love, love, love red. And glass. And gumball colors. And the simple shapes that make up a gumball machine. I loved the way E’s invitations turned out, and these are even cuter. We headed to Michael’s with our fingers crossed that we could pick up the supplies that we needed in one stop – and that they wouldn’t be ridiculously expensive since we needed supplies for sixteen of them. Our first pass through the glass vases and bowl aisle turned up some really large fish bowls that were $6 and up. Yikes. But we found a smaller glass section around the wedding stuff, and they had the perfect sized bowls for $1 which was much, much better. We matched up the bowl with the right sized flower pot and tray, and then we hunted through the wood section for the flat bottomed wooden balls. We had to find the clothes pin doll stands (for the pretend candy dispenser) in a different section. 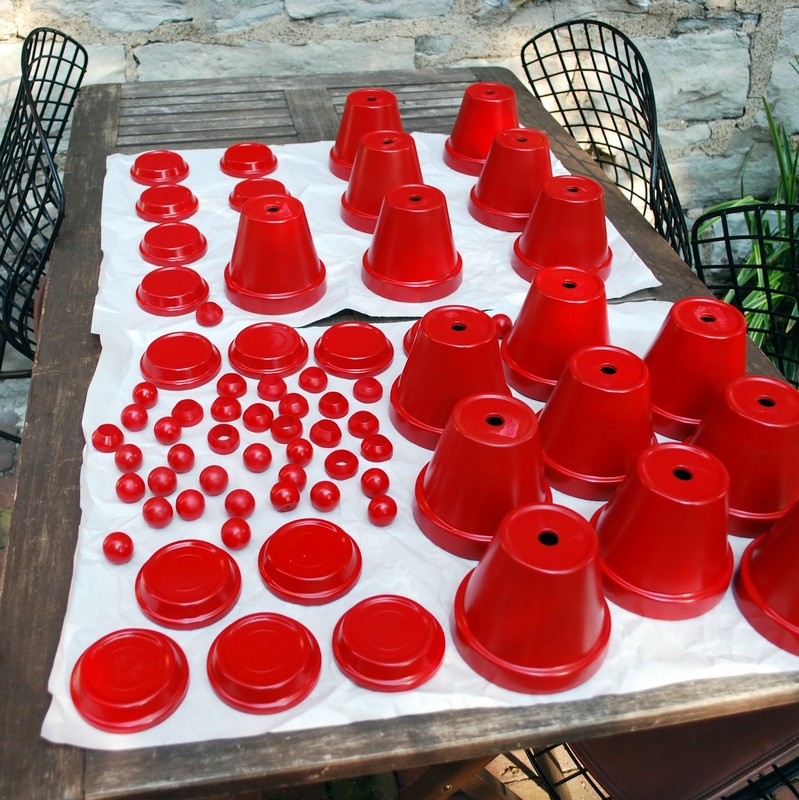 So we were lucky to find everything (including the special glue and red glossy spray paint) at one store, but we still had to go to a second location to get some more of the glass bowls since we needed more than the ten on the shelf. Yesterday afternoon, E and I spread out a big tarp in the back yard and started spraying. And that’s when I remembered the first rule of spray painting (that I broke) – always buy more than enough cans so that you don’t have to run back out and get another one. Because we ran out of paint with just a couple of pieces left to cover. 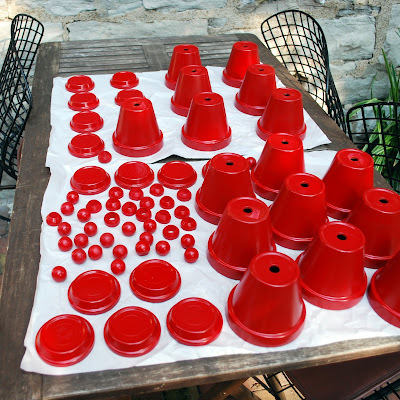 Luckily I remembered we had used glossy red spray paint before (remember the lego costume? and the mason jar sippy cups?) so we had another can of red in the basement with enough to finish the job. We got some paint pens, so we’ll let the kids add their name or decorations if they’d like, then we’ll glue the pieces together. They obviously don’t function like a real machine, but the lid rests perfectly over the glass bowl, so you can fill and then grab a gumball whenever you want. 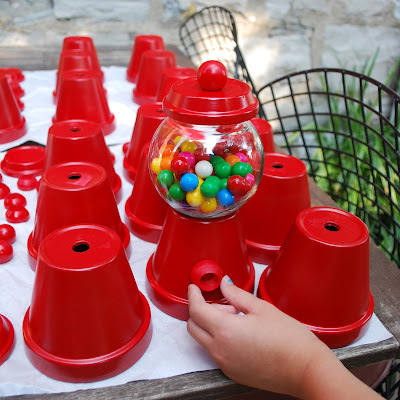 We brainstormed some cool games to play where the kids can win / earn gumballs to slowly fill up their machines. Our favorite idea includes gathering up various pipes and tubes we have in the workshop and dividing the kids into teams where they will have to work together to get gumballs from point A to point B without letting the gumballs hit the ground – just traveling through the tubes. Here’s a quick mock up of the finished project. We’ll glue one up tonight just to make sure the glue we have works and sets up fast enough for the party. And then we’ll move onto the next thing on the list – we’ve got a lot to do before Saturday! This entry was posted in making, party(ies). Bookmark the permalink. That is darling. I love it. I would start with the glass bowl you want to use, and then choose a pot size that is proportional. It’s been a few years since we made these, but you can see in the last picture with the child’s hand that they aren’t very large. I think we found the glass bowls at Michael’s, purchased one as a trial, and then tried it out with various pot sizes until we found the right fit. 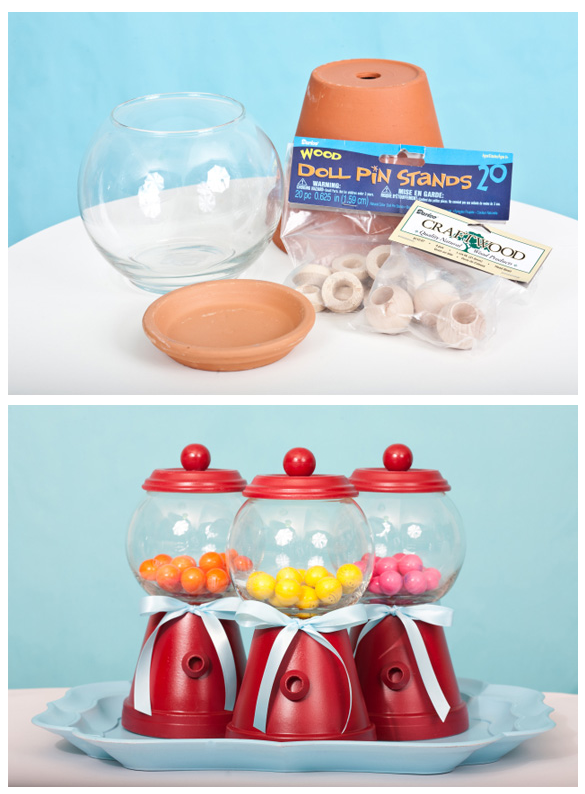 You want a pot set that comes with a dish for drainage, and that dish needs to sit correctly on the top of the glass bowl in order for the gumball machine to work. So the bowl dictates the pot size. We have looked every where for glass bubble bowls can find the big ones but we want smaller ones any idea. I got my fishbowls at DollarTree. What glue works best with this project? Silicone or liquid nails? Hi! These are so cute! I was wondering if you painted the underneath part of the dish, which is the lid, since you can’t see it? What is the gum ball spigot… Thing made of?.. What is it?